When Cataclysm was launched, it was a toss up whether to start in Mount Hyjal or Vash’jir. My hunter took the boat to Vash’jir and was literally thrown in the deep end and immersed in that underwater world until the final epic showdown between the Naga and the other servants of the Old Gods and the Elemental Neptulon. By then it seemed natural to skip Mount Hyjal and go on to Deepholm, then Uldum and finally the Twilight Highlands. Now that decision has come back to bite me, as with Patch 4.2 new quest lines and series of dailies have opened up to both factions in the Mount Hyjal area with much coveted epic (365) rewards. To be eligible to start on the quest line you need to be level 85 (and to have completed 81 of 115 Hyjal quests, up to and including Aessina’s Miracle, but not including the 6 Flamegate quests culminating in the Eggwave). The quests and dailies award generous amounts of gold, guild and Hyjal reputation, a swag of new achievements and (some quests and most dailies) Marks of the World Tree. The Marks can purchase epic 365 items, the satchel of Zen’Vorka (gives chance of companion pet) or be saved to open more advance dailies in other areas within the Molten Front. Completing the initial quest line will open up dailies at the Sanctuary of Malorne (in the central western edge of Mount Hyjal). A further quest line that ends with the challenging Through the Gates of Hell (see below) establishes the breach in the Molten Front (a discrete area accessed by a portal close to the Sanctuary) and opens up dailies in the Ashen Fields (Molten Front). Further dailies and epic items become available once the help of the Druids of the Talon and the Shadow Wardens are enlisted and three more quests have been completed. For the moment at least the Molten Front is a no-fly zone. The following guide details the eligibility requirements and introductory quests that unlocks the dailies available at the Sanctuary of Malorne and the dailies available at Malfurion’s Breach within the Molten Front and the requirements for further progression into the Molten Front with additional epic items. For more detail on the dailies see The Meek Shall Inherit Kalimdor and Into the Fire, On to the Spire – Progressing in the Molten Front. Guardians of Hyjal: Firelands Invasion! – Once you have achieved 85 the Hero Call Board (Alliance) or Warchief’s Command Board (Horde) will either ask you to assist Goldrinn/Lo’gosh, Tortolla, Aviana and Aessina or (if you have already assisted these ancients by completing three quarters of the Mount Hyjal quests up to and including Aessina’s Miracle) directs you to Matoclaw at the Sanctuary of Malorne. Quests needed to complete Guardians of Hyjal: Firelands Invasion! In other words, if you haven’t already, you will need to have completed the initial quests at Nordrassil and the adjacent Verdant Thicket to obtain Return to Nordrassil (to speak to green Dragon aspect Ysera) which makes three quest hubs available (Goldrinn/Lo’gosh, Aviana and Aessina). Goldrinn or Lo’gosh Assisted – Ysera in Return of the Ancients sends you to speak to Oomla Whitehorn at Wolf’s Run (in northwest of Mount Hyjal) in the first step to awakening the ancient wolf Goldrinn (Alliance) or Lo’gosh (Horde). This quest hub includes 17 quests plus another 6 within the portal on Lightning Ridge to the Firelands, finishing with Return from the Firelands. A vision of Ysera will appear once Goldrinn/Lo’gosh has been assisted. Tortolla Assisted – Quests become available at Aessina’s Shrine at the same time as the Goldrinn/Lo’gosh and Aviana quest hubs. Finishing the 12 quests at the Aessina’s Shrine (including the ones at Whistling Grove) opens up the quests from Archdruid Runetotem at the Sanctuary of Malorne south west of the Shrine (6 quests). The Archdruid then sends you to free the giant turtle Tortolla (3 quests). Once completed Ysera will appear praising you for earning the respect of an Ancient and signalling that Tortolla has been assisted. It is not necessary to do the later series of Tortolla quests (7 quests plus 5 sideline quests) following Aessina’s Miracle starting with Tortolla’s Revenge and finishing with the Ancients are With Us to open up the new Mount Hyjal daily hubs. Aessina Assisted – Only when you have assisted Aviana, Goldrinn/Lo’gosh and Tortolla (it doesn’t matter in which order) will Ysera ask you to seek out the oldest of trees, Nordu in the Flamewake just south of the Sanctuary of Malorne (The Last Living Lorekeeper). It is too late to save Nordu from the flames, but he asks you to give him some time by killing 5 Fiery Tormentors (Firefight). He then gives you the Heart of the Forest to take to Archdruid Runetotem (Miracle of Aessina). When you hand the Archdruid the Heart of the Forest, Aessina will appear in a cut scene and Guardians of Hyjal, Call of the Ancients will become pop up, followed by Guardians of Hyjal: Firelands Invasion! with the Archdruid requesting you report to Matoclaw at the Sanctuary of Malorne. (The Flamewake is now phased as the Regrowth though the Egg Wave quests and/or dailies are remain accessible as does Tortolla’s Revenge and the quests that follow). Now you have the lead in quest, go to the Sanctuary of Malorne and speak to Matoclaw to start the 6 introductory quests leading the Sanctuary of Malorne dailies and the quest line to open a portal to Molten Front. Opening the Door – Matoclaw urges you to go at once to Archdruid Hamuul Runtotem on Nordunne Ridge (just east of the Sanctuary) where he, Malfurion and others are in the process of opening a portal to the Firelands. Runetotem is standing back on the slope with Malfurion, Skylord Omnuron & Captain Saynna Stormrunner. A Ritual of Flame – Runetotem asks you to fight the waves of Charred Invaders while he & the other druids wok to open the invasion portal to the Flamelands on Nordunne Ridge. Assist in taking down the fire elementals. Once 105 on the bar has been reached the Elite 85 flame druid Leyara will attack. When Leyara is almost defeated she will fly away and the portal will be open. To the Sanctuary! – Malfurion instructs you to return to Matoclaw and prepare for Ragnaros’ counterattack. Caught Unawares – Matoclaw asks you to help Elderlimb, Thisalee Crow, Tholo Whitehoof and Anren Shadowseeker by killing 6 fire elementals at 3 different locations in the Regrowth (once the Flamewake) where the druids have been cut off by flames from the Firelands backlash. Thisalee is on the north side of Ashen Lake where Tortolla had been chained. Elderlimb is immediately east of the Sanctuary of Malorne where the road enters the valley with the Flamegate. Tauren Tholo and Night Elf Anren are fighting back to back at the eastern end of the valley east of the Sanctuary. This quest is the first to award Marks of the World Tree. It awards 6 Marks of the World Tree. The Sanctuary Must not Fall – the fire elemental invaders have pushed the druids back to the Sanctuary of Malorne. Runetotem at the Sanctuary asks that you stand by Malfurion as he attempts to raise Malorne to prevent the sanctuary from falling. Stand next to Malfurion until the cut scene in which Malorne awakes and defeats the regular elementals and massive elemental Lord Ryolith. Dailies will now be now available at the Sanctuary of Malorne. This quest awards 10 marks. Calling for Reinforcements – Archdruid Hamuul Runetotem asks you to get 20 marks of the World Tree. You should already have 16 marks from the previous quests and completing the first level dailies will make up the total. Handing in the quest will use up your marks. Rage against the Flames (kill 7 of the fiery invaders in the Regrowth or Serthia’s Roost) OR Supplies for the Other Side (7 collect Blueroot Vines). Any of these quests will award 1 Mark. Call the Flock (summon 12 Alpine Songbirds, 5 Forest Owls, and 2 Goldwing Hawks found in the northern Regrowth) OR Perfecting Your Howl (howl over 10 defeated enemies found anywhere in the Regrowth) OR Punting Season (punt baby turtles wandering beside the Ashen Lake out of reach of the fire elementals and back into Lake) OR Spirit Between the Trees (Catch 3 of the phantom stags in the eastern Regrowth) OR Those Bears Up There (Rescue 6 bears taking refuge in the trees of Whistling Grove). These quests award 1 Mark. Each of these quests opens up an encounter either with the elite Shadow form of the relevant Ancient and/or enlists that Ancient to help against an elite foe. Wings A Flame (summon and attack the elite fiery bird Millagazor at the Firelands portal just north-west of Ashen Lake) OR The Call of the Pack (summon and defeat Lylagar, a elite Core Hound at the portal at eastern end of southern valley) OR Echoes of Nemesis (summon and defeat the elite giant, fiery turtle at the portal on the southeast side of the Lake) OR The Power of Malorne (summon and defeat Naga Flamewalker Galenges at the eastern portal) OR Natue’s Blessing (use the Emerald of Aessina to summon and kill the giant spider Pyrachnis). These 85 Elites are not too difficult to solo though each has a damaging flame or poison attack. You will still be credited the kill if you join in the fight with another player (though not for the achievement Infernal Ambassadors). Each of these quests awards 2 marks. For more detail on the early Sanctuary of Malorne dailies see The Daily Round in Hyjal (coming soon). Once you have your 20 marks you can hand them into Archdruid Runetotem to begin the next quest line and to open up further dailies at the Sanctuary as well as dailies at Malfurion’s Breach. The Molten Front Quest line become available with the completion of Calling on Reinforcements (costs 20 marks). Leyara – the Archdruid Hamuul wants you to deal with the Druid of the Flame Leyara who has been sighted in the northwest. Leyara is on the small broken bridge at Leyara’s Sorrow, a ruined shrine tucked into the western ridge of the valley west of the Shrine of Aessina (in the northern Regrowth & just west o f Whistling Grove). After a brief conversation Leyara will immobilize you & then crisp Archdruid Hamuul who arrives just as your conversation ends. A Hyjal guardian will appear and instruct you to report back to Matoclaw. Through the Gates of Hell – Malfurion Stormrage urges you to pass through the portal on top of Nordunne Ridge (immediately north of the Sanctuary) and meet him on the other side to help him secure a front in the Molten Front. Be prepared as soon as you enter the portal to fight for your life. The object is the assist Malfurion defeat the Obsidian Slaglord (85 elite fire elemental). Every one to two minutes the ground in a wide area around the Slaglord will become deadly – with many fiery circles appearing in quick succession followed by damage dealing earthen spikes. Malfurion occasionally sets off Tranquillity but this healing spell is too infrequent to counter the damage of the spikes. Once the ground begins to glow red move out of the way and keep moving. Once the spikes have stopped, move in fast to hit the Slaglord. Watch out for the elemental adds – these are easy enough to defeat but can be annoying while you are dodging the spikes. If you need a minute to recuperate, the graveyard immediately east of the portal is probably the most protected area from the spikes. If you do die, resurrect as close to the graveyard as you can and continue the fight. This quest awards 15 Marks of the World Tree. Once the Slaglord is defeated Malurion will lead you to a small cave with a narrow entrance to the west (47.1,88.3), the new staging area Malfurion’s Breach will be set up, and the quartermaster (the troll Zen’Vorka standing in the cave with Malfurion) and new dailies will become available. Four epic items (level 365) will be immediately available and can be purchased for gold. Other items (costing 30 marks each) will become available once you open up the next stage (total cost 300 marks) and three additional quests. The Marks can be obtained by the dailies in the Molten Front and the Sanctuary of Malorne (about 15 each day at this stage). Druids of the Talon – obtain 150 Marks of the World Tree to enlist the aid of Sky Lord Omnuron and the Druids of the Talon in Malfurion’s efforts to establish a permanent outpost with Sentinel Tree in the Firelands. Completing this will open up the Druid of the Talon dailies. The Shadow Wardens – obtain 150 Marks of the World Tree to enlist the aid of Captain Saynna Stormrunner and the Shadow Wardens. Completing this will open up the Shadow Wardens dailies. Additional Armaments (requires 125 Marks) & Well Armed opens up the goblin Ricket dailies. Calling the Ancients (requires 125 Marks) and opens up Shalis Darkhunter dailies and a new Vendor Varlan Highbough. Filling the Moonwell, Additional Armaments and Calling the Ancients are needed to unlock Zen’Vorka epic items (695 Marks from start to finish). There is also a range of new achievements associated with the Sanctuary of Malorne/Molten Front quests and dailies like Infernal Ambassadors, Fireside Chat, The Meek Shall Inherit Kalimdor etc culminating in Veteran of the Molten Front. This is a massive amount of new content with some good rewards as well as progression of the story though, apart from the initial 4 epic items, it also will take time and dedication to unlock them. And as with that initial choice of which zone to start the new Cataclysm content – Mount Hyjal or Vash’jir – so there will be choices along the way – which faction to work towards first the Druids of the Talon or the Shadow Wardens, the Armament quests or the Calling of the Ancients or the Filling of the Moonwell. If, like my hunter, you need to play catch up to get started don’t be too worried as it takes perhaps 2-3 hours to complete the necessary Mount Hyjal quests to phase from the Flamewake to the Regrowth with Aessina’s Miracle and to begin doing Mount Hyjal dailies. Not all wrong turns in life are repaired so easily. Into the Fire, On to the Spire – Progressing in the Molten Front – the Furnace (Druids of the Talon) and Forlorn Spire (Shadow Council) dailies and achievements. 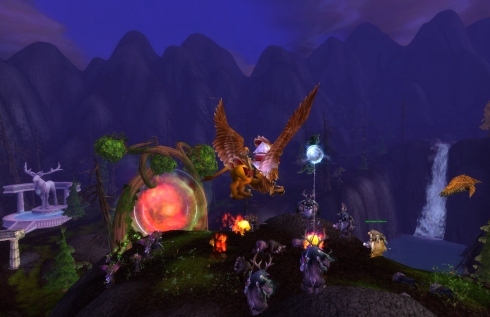 Come one, Come all – a guide to the revamped Darkmoon Faire – new quests, dailies and rewards.